Doctor Who Series Nine – 2015 | The Daily P.O.P. 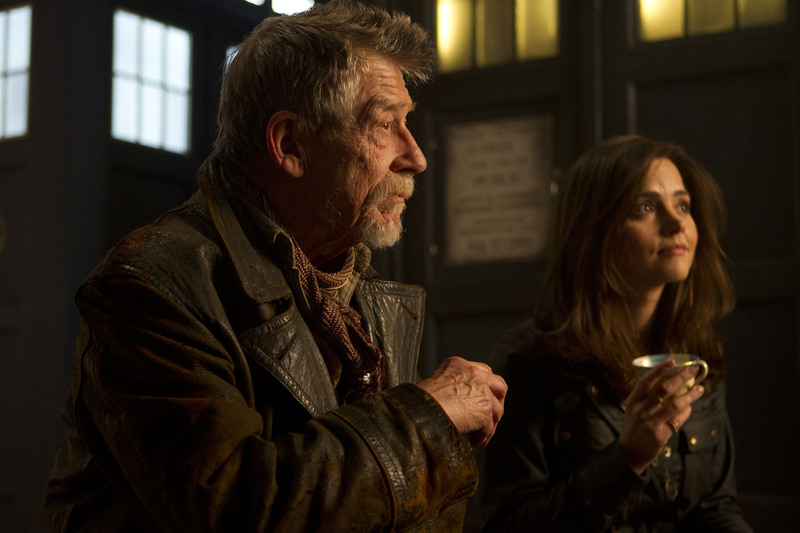 In sharp contrast to previous sequences, Clara and the Doctor are not the centerpiece of this week’s story. Sleep No More is an experimental episode told via ‘found footage’using a first-person point of view. Sleep No More has been getting damning reviews from fans, but I quite like it. Even though this is essentially ‘Attack of the Eye Boogers,’ it’s just a spin on the traditional ‘base under siege’ story that has been used since the 1960’s. The added flair is that the monsters win in the end in a way that doesn’t really make sense. Quite a change of pace from the Doctor defeating the monster in a way that makes no sense! For the uninitiated, Doctor Who is a long-running science fiction series that screened for 26 years from 1963-89 with a triumphant return in 2005. Doctor Who’s greatest strength is its variety and outlandish style. The leading man (referred to only as ‘The Doctor’) has changed twelve times over its 50 years with more to come and each time this change occurs, the character of the Doctor has altered. Aided (and often hampered) by young travelling companions, the Doctor faces dangerous obstacles and bizarre aliens throughout the entirety of time and space (but usually England). Whereas the 1963-89 program had limited success that tapered off toward the end, the current series has obtained a strong following. The program is a cult phenomenon combining elements of science fiction, fantasy, history, comedy, action and drama. It really is like no other TV program and as such it’s an acquired taste. In this week’s installment ‘Sleep No More,’ the time travelers are aimlessly wandering about before being discovered by a rescue operation to a space station orbiting Neptune. The station appears to be empty and as the exploration continues, a series of sleep pods, called Morpheus, are found. Clara gets snared into one of the pods and is immediately placed into a sleep state with a hologram of dancing girls hovering over the lid. The cloned ‘grunt’ notices that one of the pods is occupied and Gagan Rassmussen, the man who opened this episode explaining the unusual nature of the narrative. After much prodding, Rassmussen explains that he has been enhancing the Morpheus pods which compress sleep into 5 minute bursts allowing the surviving members of the human race to be more productive. The Doctor is horrified by this revelation and explains the importance of sleep for the quality of life, citing poets and playwrights from human history to back this up. In no time, strange horrific monsters attack the survivor, rescue team and the TARDIS crew. To add to the confusion, the creatures are reduced to sand-like granules when under stress. Then the satellite begins a drastic fall from orbit and a loss of heat shielding. Using his sonic sunglasses and the helmets worn by the soldiers, the Doctor defuses the situation but cannot understand how or why the creatures (dubbed ‘Sandmen’ by Clara) could do this. After Rassmussen is devoured by a Sandman, the Doctor and Clara lead a daring chase through the satellite with the only surviving member of the rescue squad, Nagata. Befuddled, the Doctor pieces together that the entire affair is being masterminded by Rassmussen but cannot understand why. The scientist gladly explains that a side-effect of the Morpheus’ ability to compress sleep is the creation of a new, superior, life form. He endeavors to aid this new life form which can find its way into a victim’s body through the corner of one’s eye with dreams of galactic conquest. The Doctor defies Rassmussen and manages an explosive escape. Even after defeating a monster made of five years’s worth of Sandman material, the Doctor is not convinced that he has succeeded in foiling Rassmussen’s scheme. In a video that only the viewer can see, Rassmussen reveals that the invasion is through the video itself and that if it is being viewed, the Sandmen are already on the move. Sleep No More is the second foray into first person point of view as a mode of storytelling (previously used in Love & Monsters), but this attempt was far more in-depth with only footage via headcams and security footage used, eventually including Clara and Nagata’s point of view sans camera. There has been outcry over this episode with viewers claiming that it is incomplete and incomprehensible. Interviews with Gattis have revealed that the initial script was two-parter, but maintained the open ending. A devoted fan and scribe of novels, audio adventures and several episodes for the new program, Gatiss added nods to the classic era. The Doctor casually mentions The Silurians (from the 1972 story, the Sea Devils), the Great Catastrophe (introduced in the underrated 1984 story Frontios), and even a ‘When I say run, run!’ command dating back to the Troughton era. Gatiss was influenced by classic adventures that hinted at a vast future at war and strove the leave hints at this in his script, but due to the truncated length of the story from two to one parts, these details get muddied and confuse the action. The visuals of Sleep No More are quite striking and the stellar acting ability of Capaldi (whose face fills the screen much of the 45 minutes) is top notch. After a foray into decidedly wacky behavior earlier in the year, it appears that the ‘Thin White Duke’ of old is back. From next week’s preview images, it seems be seen that he has ditched the disheveled hoodie and check trousers for a more refined look including a red velvet jacket that would be at home with Third Doctor Who, Jon Pertwee. The ninth series of Doctor Who has been controversial with fans. As any regular reader of my blog will attest, I am much more critical of the new series in comparison to the 1963-89 program. However, I have been re-watching the past few years with a much more casual eye and recognized the strength of the new series lies in its ability to fascinate viewers with bizarre situations and visuals that cannot be found elsewhere. From a room full of ventriloquist’s dummies in an alien hotel to graffiti that comes to life and a lion-headed fire-breathing alien… Doctor Who excels at leaving viewers scratching their heads wondering what they just witnessed. … and hopefully come back for more. The 2005-present Doctor Who program has added a new element of melodrama which more often than not hampered my enjoyment but was still an essential part of its success. Just mention Rose Tyler to a fan and they will tear up. The past few years has seen a departure from the ‘Doctor in love’ angle as well as a less hug-able leading man. I applaud these changes, but as the viewing figures and outcry indicates, I could be in the minority. The 9th series has been incredibly ambitious with all two-part stories with the exception of two episodes (this week and next). This year’s 9 installments are wildly diverse in tone, use time travel in new ways, explore topical subjects using fantastical characters and introduce a new layer of absurdity to the program. After seeing the negative reception it received online, I entered this week’s episode with low expectations but was pleasantly surprised. While not a classic, Sleep No More is chilling and weird with a threat so deadly that even the Doctor cannot fathom it. And we could use more of that. Open endings have been used before in Idiot’s Lantern (where did the Wire come from?) Impossible Planet (was the Beast really the Devil? Was it Sutekh? Did the Doctor defeat it) and even Listen (what was that thing knocking at the door and hiding under the bedding? ), but fans seem to be furious that this story was not resolved. Personally, I think that the muddy nature of a script crammed with too many ideas due to a reduced running time and a monster essentially made from grit that you scrape out of the corner of your eye are the main problems preventing enjoyment of this story. But even accepting those limitations, it moves quickly and introduces a new scary monster as well as clever tech and some positively unsettling moments. Even the Doctor admits to being scared! Note- Mark Gatiss has confirmed that Steven Moffat has already asked him to write a sequel to this story. Overnight figures only include those who watched it live and those who recorded and watched it later that night. Final figures includes those who recorded and watched within a week, making them a more accurate measure of how many were watching. Live Plus 7 (L+7) counts those who watched live and all repeats, including iPlayer, within seven days following broadcast. The Audience Appreciation Index (AI) is a score out of 100 which is used as an indicator of the public’s appreciation for a show. Over 90 is considered exceptional, 85 or over is excellent, 60 or less is poor, and less than 55 is very poor. Since its return in 2005, the Doctor Who Christmas Special has been traditional. Some are better than others, but this year, fans will see the return of roguish time travelling flirt (and Roger Daltrey impersonator), River Song. The time line of River Song is so convoluted that this could be the time that the Doctor hands her a specially designed sonic screwdriver or teaches her to drive the TARDIS. Or not. We have seen River’s death, her birth, regeneration, her wedding and even her ghost, so I’m unclear on what is left for her to do… but the special guest star isn’t the only reason to get excited. 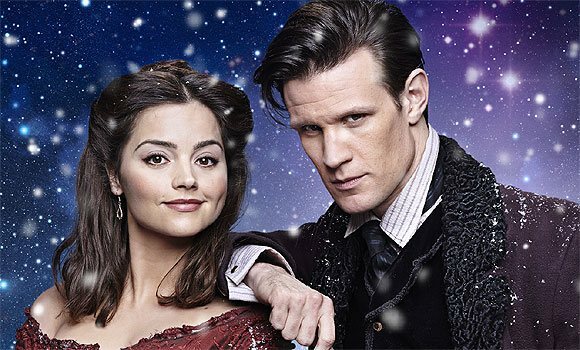 The 2015 Doctor Who Christmas Special will also be shown on the big screen on December 28th! Peter Capaldi and Alex Kingston together on the big screen? Where do we sign up? For the first time, the Doctor Who Christmas special, which will premiere Christmas Day on BBC AMERICA, will also hit U.S. cinemas, with BBC Worldwide North America and Fathom Events announcing a two-night special theatrical event. The event will be in theaters December 28 and 29 at 7:30 pm local time and feature an exclusive interview with Alex Kingston, who is returning as River Song for the special, as well as a 15-minute behind-the-scenes “making of” featurette starring Peter Capaldi, Steven Moffat and more. The theatrical event is expected to screen in nearly 300 theaters, according to a press release. Tickets can be purchased starting Friday, November 13 by visiting the Fathom Events website or a participating theater’s box office. For a complete list of theater locations, visit the Fathom Events website (theaters and participants are subject to change). It’s Christmas Day in the future and the TARDIS is parked on a snowy village street, covered in icicles, awaiting its next adventure. Time traveler River Song meets her husband’s new incarnation, in the form of Peter Capaldi, for the first time this Christmas. Since she first appeared in 2012’s Asylum of the Daleks, Jenna Coleman’s Clara Oswald has been a divisive character… and frankly it’s all Steven Moffat’s fault. Introduced as a recurring character who appeared throughout the Doctor’s timeline, cryptically oblivious to her previous appearances then dying before the Doctor could figure her out, Clara Oswald was the focus of the program… then she became even more important. She dove into the Doctor’s time line and saved him over and over, even influencing which TARDIS to steal when he left Gallifrey. This is a disturbing trend in the modern Doctor Who to place the emphasis on the companion rather than the Doctor. Moffat has even gone on record as saying the companion is more important than the Doctor, which indicates a flawed approach. To make matters worse, Moffat introduced a character with a definite arc, completed the arc, then had her remain. This isn’t the first time this has happened, of course. We had already seen Rose imbibe the time vortex and un-write the Daleks from history… then awkwardly stay as a companion, lose the Doctor then come back AGAIN. Amy Pond was another mystery the Doctor was obsessed with unraveling and after she was involved in the second Big Bang and getting to the wedding she was avoiding… she also rejoined the Doctor which made no sense. Someone needs to explain to these award-winning writers that stories have beginnings, middle and ends. Not several staggering ends like a recurring prank phone call. Nevertheless, Jenna Coleman has remained a pivotal companion through more key moments in the program’s history than any other character to date with the possible exception of the Brigadier! So it comes as no surprise that many fans do not like (or hate) Clara. She has also been portrayed as instrumental to any successful activity by UNIT yet remains a character whose greatest strength on the surface is being a ‘cute as a button’ school teacher. 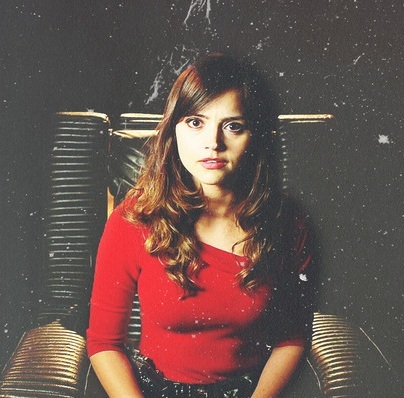 Despite all this, I quite like Clara. She’s something of a throwback to Sarah Jane Smith, an everyday city dweller with a sassy attitude and remarkable fortitude in the face of danger. She has also greatly influenced the Doctor’s character, often in spite of his reluctance to accept her (as seen in last year’s adventures when the Doctor and Clara flat out did not get along at all). Coleman has exhibited an unusually wide range of characteristics from comedic to dramatic, to adventurous. She is sometimes the most important person in the room and other times the brunt of a joke or an outright insult. She has charted the course of a story and been the victim of circumstance. She really is a stand out actress who holds her own against those who came before her, yet I can sympathize with the fact that she was thrust down our throats as important and the scripts continue to make this mistake. If Moffat had more faith in the Coleman, she would have been allowed to show us how great she is rather than reminding the viewer that she’s the *impossible girl* over and over, which is a shame. Jenna Coleman is only listed as being on the cast list for the next two episodes and her fate has been hinted throughout this season. Moffat has also stated that it will be a tear-jerker (much the same way as the loss of the Ponds was). I predict that after she is gone, Clara will be remembered as an important and much-loved companion. After all, you don’t know what you’ve got until it’s gone. On far off Skaro, war has been waged between the Kaleds and Thals for so long that a weird blend of old and new technology from biological warfare to the bow and arrow are used by troops on the battlefield. A young boy finds himself in a ‘hand-mine field’ and is set for a grisly death until the Doctor arrives to save his life. However, when the Doctor asks the boy his name, he discovers that it is none other than the creator of the Daleks known as Davros. Skaro is presented with such wild abandon and inventive glee, giving life to the vision first presented in 1974’s Genesis of the Daleks with boy soldiers fighting a war that degraded a planet’s culture. As openers go, this was a jaw-dropper. From there, we are given glimpses of Russell T Davies and Steven Moffat’s Star Wars-esque cantina where weird aliens listen to Nick Cave, then a quick trip to the super obscure Shadow Proclamation (remember them??) Visiting both is one of the most unintentionally hilarious aliens ever in Doctor Who, a man made of snakes who moves like he is wearing roller blades and wriggles ‘in thought’ as if he is either about to erupt into giggles or is secretly pleasuring himself under his robes. He is of course looking for the Doctor because, ‘Davros knows.’ The Doctor is uncharacteristically hiding out, though and no one can seem to find him. On contemporary Earth, Clara Oswin is teaching at Coal Hill School when she notices a passenger jet hovering in the sky, as if frozen in time. She urges her class to check their phones, especially Twitter, for news. She is then drafted into active duty by U.N.I.T. who have apparently been searching Google (and Twitter) for clues and frantically waiting for a cute school teacher to arrive and point out the obvious. The global security force tasked with protecting the human race from unusual menaces, U.N.I.T. has seen better days. They appear to be winging it with less ability than a lemonade stand thrown together by two puppies and a newt. The Master (sorry, Missy) appears with Toni Bail references and impractical special effects, holding humanity hostage… for tea with Clara. Yes, everything revolves around the cute as a button Clara. Missy is in possession of an unusual device, a disc containing the Doctor’s will, to be opened on the event of his death. She states at length that she and the Doctor are old friends and that Clara is ‘simply a pet dog’ in comparison. Yet even Missy cannot find the Doctor, but Clara, using a laptop, can. This leads to one of the most embarrassing moments in Doctor Who as the scene shifts to a gladiatorial battle in Essex, 1138. To combat an axe-wielding barbarian, the Doctor arrives atop a tank playing electric guitar and wearing sunglasses. He then makes bad jokes and upon noticing Clara watching from the ramparts, plays Roy Orbison’s Pretty Woman. There had been statements that there would be more comedy, especially after last year’s grimmer year of stories, but this is just taking it too far. Even Clara is flabbergasted by his behavior, and the Doctor states that he is celebrating his last day alive by honoring his many-faceted personality. It appears that the Doctor has suffered a mental breakdown and is a shattered version of his former self. I’m reminded by a Bob Haney Brave and the Bold comic book in which Batman learns from Adam Strange that he is going to die. Rather than face his demise with expected stoic bravery, Batman turns into a nervous wreck, seeing conspiracy and danger around every turn. I suspect that given his experience encountering young Davros has bent his psyche and he is a demented mess. In any case, The Doctor, Clara and Missy are all taken to Davros (played with aplomb by the brilliant Julian Bleach) who is also dying and wants the Doctor to bear witness.In another room, Clara and Missy attempt to escape in the TARDIS but are instead cornered by an army of Daleks. Davros watches with glee as his ‘children’ zap first Missy, then Clara and finally the TARDIS into smithereens. I desperately wanted to enjoy this story. The design work is phenomenal and the varied Daleks look stunning. While they were not used much, the dreaded pepper pots are effective. Yet the humor is so off-key and absurd and the intelligence of the characters so dim that I find it difficult to get fully invested. Last year, there was a definite decision to darken the tone of Doctor Who and introduce a colder, more alien and terse incarnation of our hero who willfully stood by while those around him died and referred to humans as ‘pudding brains.’ This year, it seems that Moffat and company have back pedaled to the world of whimsy and wacky humor that we have already seen in Matt Smith’s era. I am hoping that this is all a red herring as Clara, Missy and even the sonic screwdriver (lost in this story) have all been seen in images from subsequent episodes. The Doctor, here dressed in baggy check trousers, a hoody and t-shirt has been presented as much slicker and more refined in a crushed red velvet jacket in other promotional material. Therefore, I am seeing a massive reset button waiting to be pressed next week. Despite my grumbling, this is a beautiful looking story and a very outlandish Dalek adventure, the likes of which we have not seen to date. I am intrigued to see where the story can go, but a tale that deals with the consequences of actions is surely going to unravel those problems with magical timey-wimey nonsense as we have seen several times over. If I’m wrong, I will be happy as a mutant clam. 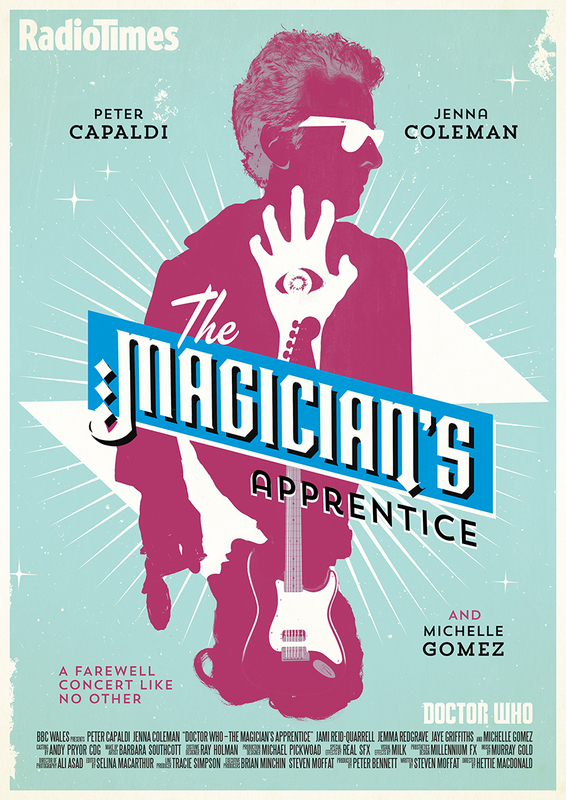 While the UK overnights could have been stronger,The Magician’s Apprentice was the highest rated season premiere to date in the US on BBC America. The premiere episode ranks as Doctor Who’s biggest season premiere ever overseas in the Adult 18-49 demo, which nearly doubled the Series 8 average. The season debut also saw increased social engagement versus last season’s premiere, and reigned as the most social drama of the night and week leading into the premiere. The premiere telecast delivered 2 million total viewers and 1.1 million Adults 18-49. 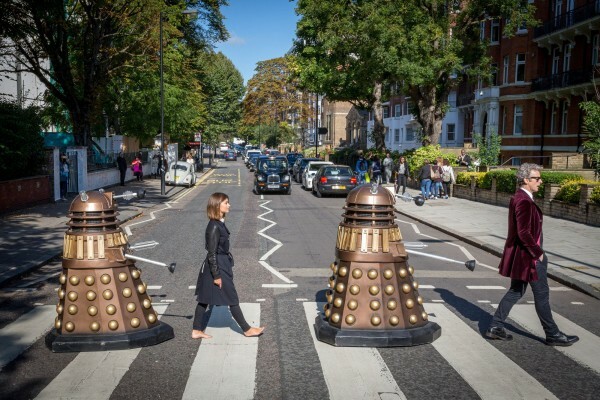 Among A18-49, Doctor Who propelled BBC AMERICA to #3 in its timeslot, out-delivering the big 4 broadcast networks and ranking only behind college football on ESPN and the finale of Sábado Gigante on Univision. In the A18-49 demo, Doctor Who is now one of just 14 dramas on TV this season to show any growth from its prior season premiere (out of 100+ returning dramas). The A18-49 audience ranks as Doctor Who’s biggest season premiere ever on BBC AMERICA, nearly doubling the S8 average (+95%). In the demo, episode 901 ranks among the top 10 returning cable drama premieres this season, beating Homeland, Suits and The Strain, among others. All tracked demos showed increases from the season 8 average with the most significant increases seen among the younger demos, most notably P12-24 (+186%) and P18-34 (+161%). The episode reigned as the #1 most social drama of the night based on ListenFirst’s Digital Audience Ratings for Television. It was the #1 TV brand on Tumblr, the #1 drama on Facebook, Twitter and YouTube and the #2 drama on Instagram, following The Walking Dead. It was also the #1 most social drama of the week. Episode 901 garnered larger social engagement than the most recent season premieres of Scandal, Agents of S.H.I.E.L.D, True Detective, Outlander, Glee, and The Flash, among others. The 9th series of Doctor Who promises to be yet another in a long line of game changers with everything hanging in the balance. Steven Moffat has leaked numerous details regarding the stories for the year which hint at revelations regarding why the Doctor initially left Gallifrey. The Radio Times has more details.